Münster is a city in North Rhine-Westphalia, in the northwest of Germany. Münster was founded as a monastery in 794 by the Frisian missionary Saint Liudger to aid Charlemagne's campaign to gain control over the Saxons. The city's name is derived from the word "monastery" which can be seen from its Latin name of Monasterium. In 805, Münster was made a bishopric and, in 1170, it obtained its town rights. For centuries the city and its surrounding (the Münsterland) was ruled by powerful prince-bishops who were religious leader, political ruler and supreme judge at the same time. During the Middle Ages, Münster was a member of the Hanseatic League, becoming a prosperous trade city; the proud patrician houses on Prinzipalmarkt give evidence of this era. In 1534 and 1535, Münster was ruled by the radical Protestant sect of Anabaptists led by the Dutch preacher Jan van Leiden who crowned himself priest-king of the "Kingdom of Zion", expecting an imminent end of the world. The movement was brutally suppressed by the Catholic Church and their leaders tortured, executed and put into cages that were hung on the city's highest steeple (the cages can still be seen hanging on the St Lamberti Church's tower). In 1648, the Westphalian Peace treaty was negotiated and signed coevally in Osnabrück and at the Rathaus (city hall) of Münster (envoys of the different parties were constantly riding between the two cities back and forth), marking an end to the Thirty Years' War. 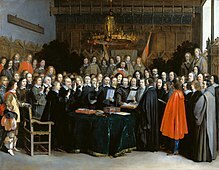 This peace treaty gave rise to the modern concept of state sovereignty which is known as the "Westphalian order" among international law scholars. The city is proud of this heritage, claiming the slogan of being "the city of Peace". In 1815, the Prince-Bishopric of Münster was annexed by Prussia and Münster became the capital of the Prussian province of Westphalia. Since then, it has been dominated by administrative and judicial institutions, professional services and trade, while industry never played a big role. The city has long had a reputation of being deeply "black", i.e. Catholic and conservative (while most cities in North Rhine-Westphalia were dominated by the working class and were considered strongholds of socialism and thus "red"). Münster University was founded in 1773, but it was closed down by the Prussian government in favour of the newly-founded University of Bonn. It was however re-established by German Emperor William II in 1902 who also confered his name to it (Westfälische Wilhelms-Universität). Since then, the number of students has massively grown. Nowadays, the University and the Münster polytechnic (Fachhochschule) have about 50,000 students in total—a significant share of them being international students—who have given the city a much more liberal and diverse outlook, contrary to its traditional image. Since Westphalia was merged into the state of North Rhine-Westphalia, Münster has lost its capital role to Düsseldorf, but the city of just over 300,000 inhabitants still hosts several administrative institutions, courts of justice, insurance and trade companies and, first and foremost, educational institutes. It is home to high-tech startups. To many Germans, Münster is a household name because the popular crime series Tatort which is regularly watched by more than a third of the German TV audience has a number of episodes set here known for their tongue in cheek humor (unusual for Tatort otherwise) and the "unlikely couple" of Prof. Karl Friedrich Boerne, a coroner, and Frank Thiel a carless bike-driving cop with a hippie father. While much of the episodes is actually shot elsewhere, popular landmarks still feature prominently in many episodes. Münster has decent train connections to the rest of Germany, mainly towards the north and south. Hourly intercity services connect Münster to Hamburg, the Ruhr and Cologne; intercity services to Frankfurt call every two hours; while other destinations are served more sporadically, though some as far-flung as Salzburg in Austria. Regional services are pretty good and provide hourly direct connections to most of the federal state. The central station (Hauptbahnhof) is to be found as Münster(Westf)Hbf in DB's booking system. 52.1346427.684832 Münster-Osnabrück Airport (FMO IATA), ☎ +49 2571 94-3360. Münster's own airport has lost connections since Ryanair and others left. There are still several domestic flights and flights to warm weather destinations around Europe. It is a 40 minutes' bus ride from the city (buses S50 and R51, half-hourly during daytime, hourly in the evening, less frequent on Sundays and public holidays, €7.60). Taxis cost €50–60, make sure to negotiate a fixed fare. If flying, Düsseldorf Airport (DUS IATA) is your most likely option. Direct flights land from most major European airports, interspersed with the occasional intercontinental flight. Trains take about 1 hour 40 minutes to Münster (on the RE2 line, hourly, €25). A taxi is likely to cost you €180 or more. By car, Münster can be reached by Autobahn A 1 from both the north and the south and Autobahn A 43 from the southwest. On Saturdays, traffic into the city becomes a nightmare, so park your car at one of the four free Park and Ride lots (located on the main axes into town and marked by P+R signs) and take the bus into the centre. Intercity bus lines are not as cheap as they used to be, but there are still deals to be had when you book early and are flexible with departure times. Flixbus is by far the biggest player in the market. Some international destinations are served by Eurolines. Buses arrive at and leave from behind the train station. Münster has a lot of bikes which creates a really special atmosphere. The city is rather flat, and is home to about 50,000 students, so naturally traveling by bike and on foot are the key modes of transport. All sidewalks outside residential areas have a red-brick section reserved just for cyclists (walking on this section is a gaffe which may cause cyclists to ring their bell angrily! ), and the entire city has a pedestrian/cycle path that surrounds it: The Promenade follows the route of the city's long-gone medieval walls, and it makes for a very nice walk, taking you past the lovely Aasee (a large artificial lake surrounded by a park). While both walking and cycling are perfectly safe, some cyclists drive at a rather brisk pace and don't expect people to cross cycle routes without looking and getting hit by them can leave you seriously injured. 51.95627.634051 Radstation, Berliner Platz 27a (next to the train station), ☎ +49 251 484 0170. M–F 05:30–23:00, Sa Su 07:00–23:00. A huge bike parking lot that also rents bikes. Bikes are good quality, the location and the hours are very convenient. Electric bikes and tandems available. €8/day. Münster also has an efficient bus system operated by the Stadtwerke. Buses run between 05:00 and 01:00 on weekdays and 24 hours on weekends. Most lines run every 20 minutes, but lines tend to overlap which usually makes for a denser schedule. Due to the confusing city layout and numerous construction sites, the whole thing isn't altogether straightforward, which isn't helped by the fact that all lines change around 21:00 when the entire system is switched to night traffic. Late at night, buses can be up to 70 minutes apart, so check the schedule beforehand. All lines meet at Hauptbahnhof (the central station). Ticket machines are sparse, but you can purchase tickets from the driver at a surcharge. Neither accept cards, not even German debit cards. A single ticket (Einzelticket) costs €2.60/€3.00 (regular/onboard fare), but if you're making a return journey, buy a day pass (9-Uhr-Tagesticket) for €4.90/€6.20. Remember to stamp your ticket when you board. Almost all the interesting sites are concentrated in the city centre, which is easily walkable. 51.961667.627981 Peace Hall (Friedenssaal) (Historisches Rathaus). Located in the old city hall, is famous for the signing of the historic Treaty of Münster, a document which, as a part of the Peace of Westphalia, ended the Thirty Years' War and established the Westphalian style of diplomacy between sovereign states. 51.962577.628372 Prinzipalmarkt. The Prinzipalmarkt used to be the city's main market street. It was heavily bombed during the Second World War, but unlike elsewhere, where ruins gave way to faceless blocks of concrete, the houses were rebuilt, some following the original plans and some merely inspired by the old architecture. Try to spot to houses with identical gables (hint: there aren't any, but they're all pretty). Today it is home to many of the city's more exclusive (some might say posh) shopping establishments. 51.963077.625783 St. Paul's Cathedral (St.-Paulus-Dom), Domplatz 28. Münster is known for its vast number of churches that dot its entire cityscape, including gothic St. Lambert's (Lambertikirche) and Baroque St. Clement's Church (Klemenskirche). The city's most impressive church, the St. Paul's Cathedral, is well worth a visit. 51.963647.613234 Palace (Schloss). It was finished in 1787 as one of the last major high-Baroque buildings in Germany (by that time Rococo and even Neoclassicist styles had already become in vogue), designed by Johann Conrad Schlaun, Münster's leading Baroque architect. Unfortunately, Prince-Bishop Maximilian Friedrich, who had commissioned the building, never got to move in there, having died three years earlier. His successor didn't bother much, and shortly thereafter Münster lost its status of prince-bishopric and the palace was used for other purposes. These days it is home to the university administration. During World War II, it was heavily damaged. The exterior was entirely rebuilt in the original style while the interior rather reflects the preferences of the 1950s. There's little to look at inside (although doors are open during university hours), but its façade is a curious and very characteristic combination of sandstone and red brick. During summer, lots of events are held on the square, somewhat marring the view more days than not. Behind the palace, surrounded by a pentagonal moat, are the extensive palace grounds, occupied by a tranquil landscape garden and the University's 51.963697.609895 Botanical gardens. daily 08:00–16:00, longer hours in summer. You don't need to be a biologist to enjoy a lengthy stroll along the paths lined by some 8,000 different species. When the weather turns ghastly (it often does), you can seek refuge in ten greenhouses and pretend it's summer. Free. 51.9855567.5511116 Haus Rüschhaus (near Münster-Nienberge, about 7 km west of the city centre). Late-Baroque country house, former residence of the poet Annette von Droste-Hülshoff, beautiful and well-maintained Baroque garden. 51.9605687.633037 City Museum (Stadtmuseum), Salzstraße 28, ☎ +49 251 492 45 03. Tu–F 10:00–18:00, Sa Su 11:00–18:00, M closed. If you're curious how the city evolved from the tiny hamlet of Mimigernaford it was in the 6th century to become the bike-infested metropolis of today, the City Museum holds the answers. Even though the exhibits are exclusively in German, many speak for themselves, and admission is free. 51.9602087.6263478 Picasso Museum, Picassoplatz 1, ☎ +49 251 414 471 0. Tu–Su 10:00–18:00, M closed. The only museum devoted exclusively to the graphic works of Pablo Picasso. Has varying exhibits on Picasso and his life, but also his contemporaries and friends, and holds almost all of his lithographical works. Adults €10, children (6-16) €4, students €8. Zoo. There is an all-weather zoo in Münster. Swimming. There is a nice modern indoor swimming pool near the town centre. Prinzipalmarkt, the main shopping district hosts mostly expensive brand-name fashion and jewelry stores. There is a huge choice of restaurants in Münster. The cuisine of almost every country in the world is represented. 51.9619397.6283042 Stuhlmacher, Prinzipalmarkt 6 (by the Town Hall/Rathaus), ☎ +49 251 44877. Münster has a large student population so there are a range of bars such as Cafe Extrablatt and Markt Cafe (on the market square by the Cathedral). The Jüdefelder Straße (located north west of the city centre) gathers many bars and pubs such as Gorilla, Die Rote Liebe, Davidswache, Destille and more. Alternatively, you can find a huge amount of bars in the "Hafen" area (south east of the city centre, behind the main train station). Prices are usually reasonable (starting at around €2 for a beer and €4/5 for a cocktail). Pinkus Müller. Take advantage from being in Münster by drinking an Altbier at Brauerei und Altbierküche Pinkus Müller. The Pinkus Müller restaurant and bar has its own brewery producing some really tasty beers. Café Garbo, Warendorfer Straße 45-47 (east of the center), ☎ +49 251-30300. 10:90-01:30. A cafe-pub which offers good, fresh food, mostly vegetarian or vegan. A lot of fair trade and ecological products as coffee, tea, jucies, vegetables. Sandwiches for breakfast, great house-made cake, Dutch and English menue (German menue also for blind people available!). Free-wlan, changing table, a lot of newspapers, nice, warm and cosy atmosphere, also meeting point for LGBT. Since it's also a cinema you can always view a movie before or after dinner. Most movies are in German, but some are in their original languages with German subtitles. Mains €4-9. 51.9579777.6343171 Kaiserhof Hotel, Bahnhofstraße 14 (opposite the station), ☎ +49 251 41780. A really nice choice, with modern rooms. From the outside, it looks like just a modern office block type building. But inside. It is really nicely decorated it the style of a traditional older hotel. There is also a free sauna for guests. 51.95677.6334492 Hotel Conti, Berliner Platz 2 (opposite the station), ☎ +49 251 8469280. 51.9554017.6309783 Ibis Hotel, Engelstraße 53 (about 5 minutes walk from the main station), ☎ +49 251 48130. 51.9714367.5044819 Burg Hülshoff, Schonebeck 6, 48329 Havixbeck (about 12 km west of the city centre; on the D3 cycle path from Münster to Havixbeck). Romantic, late-medieval water castle owned by the noble family Droste-Hülshoff (whose most well-known offspring was the poet Annette von Droste-Hülshoff). 51.985037.7861710 Telgte (about 12 km east of the city centre; nice cycling route, or 12 minutes by hourly regional train). Lovely and peaceful old town; the octagonal Baroque St Mary's Chapel is Northern Germany's most important Catholic pilgrimage destination. Moreover there is a museum of religious traditions, a brandy distillery museum, several historic (Renaissance or Baroque) buildings, and a number of small restaurants and shops. Lüdinghausen, small town with three castles, including the beautiful Vischering water castle, 30 km south, best accessible by bike along the scenic "Route of hundred castles"
Osnabrück, the other city of the Westphalian Peace, 55 km northeast, 35 minutes by hourly regional train, or by bike along the "Peace route"
This city travel guide to Münster is a usable article. It has information on how to get there and on restaurants and hotels. An adventurous person could use this article, but please feel free to improve it by editing the page.